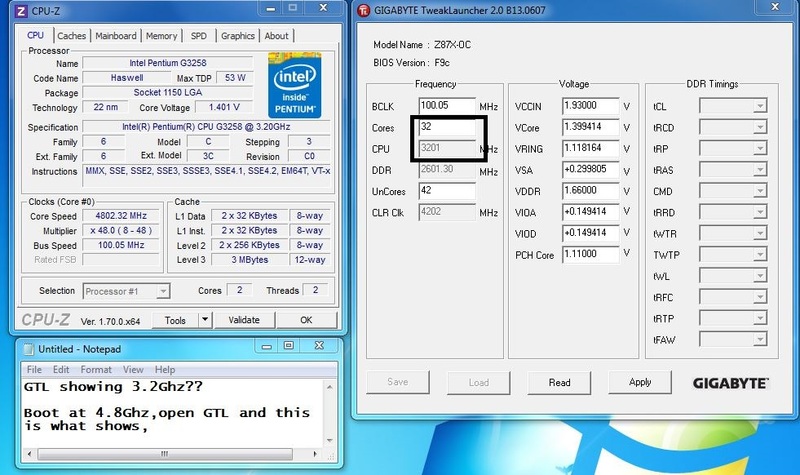 Gigabyte GTL not reading the G3258?! I was not sure were to put this question,so please remove or moove if its in the wrong section. I have problem with my GTL not reading the Pentium G3258 correct. see pic. MB Gigabyte Z87X OC bios F9c. Seems like it reads the stock clock, but I did oc from bios,as show`n in cpuz. Is this normal? First time using the GB mobo. Sorry for digging that up, but I have the same combo, Z87X-OC + G3258, bios F9c, had the same situation with cpu multi, but I also found that I am unable to stabilize my PSC at 2600 and 2666 dividers. The whole computer boots and enters into XP, but 1M is the most I can make, regardless of voltage. I tried using RAM profiles, as well as I tried to configure it manually using a screen dump I took on AsRock Z97 OCF, but it's still no go. What I found is that regardless of what BIOS settings (I tried manual and auto from both profiles) tWR is always set to 8 and I believe it's too tight for me. Unfortunately I don't have any screens with me, I'll add them later this week. 2400C8 works without issues with PSC, 2600 and 2666 work with Samsung and Hynix as well.